Rather than question what a letter 'should' look like, Barry ambitiously explores what letters 'could' look like, establishing a radical model, where the designer actively erodes their preconceived expectations of typographic form. I have been accused of being a speculatype fan girl - and there is no denying it! I have written a number of features about Barry here on typographHer.com, in the Journal and on different social media platforms because I think his work is really important in expanding the conventional territory of type design. But more broadly Barry's process demonstrates a model for innovation that any designer can apply to their work... So I am delighted Barry has self-published his doctoral research as a hardcover book that focuses on his unique speculative exploration with Latin letterforms, to share his remarkable thinking and process with the wider community. 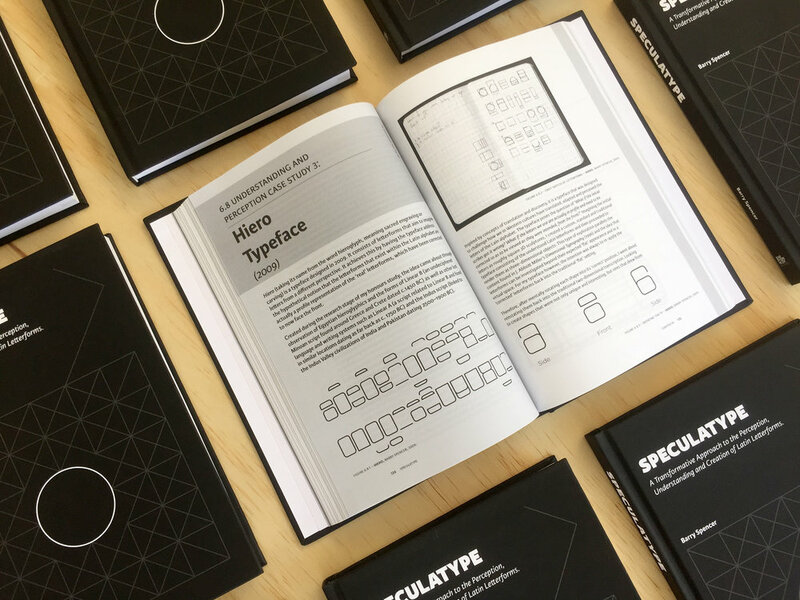 Speculatype: A Tranformative Approach to the Perception, Understanding and Creation of Latin Letterforms is now available for purchase from Barry Spencer Design, online retailers and in good bookstores.